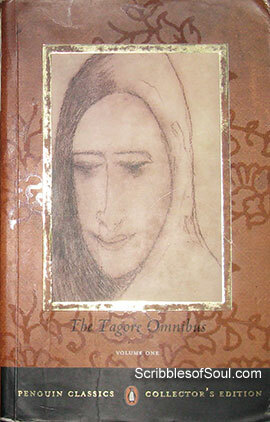 As soon as I finished reading Yogayog, I jumped upon the next offering in The Tagore Omnibus, ‘Chokher Bali’ (Well, actually it is the first one in the present edition, but I was over enthusiastic to read Yogayog first). Chokher Bali literally means ‘A grain of sand’ and the novel portraying a woman, who enters into a household as a friend, with the intention of causing havoc to the residents, does full justice to the title. The novel is about the life of Binodini, a charming girl, who is rejected by her fiancé Mahendra just before the wedding and is forced to marry a sickly man, who dies soon, leaving Binodini a lonely widow, over brimming with the venom of injustice, envy and revenge. She enters into the life of her previous suitor and befriends his innocent wife Asha, and with her beauty and deftness, soon enchants him and intends to bring about his downfall. However, the events take some unprecedented turns and Binodini soon shifts from being a temptress to a pitiable noble woman, who has been unjustly treated by society. Tagore has created her character in such an amazing way, that despite knowing that she has evil intentions, she never comes across as a negative person. In fact, I was at times more than impressed by her shrewdness and could not stop marveling at her wisdom, especially juxtaposed against the taciturn personality of Mahendra and the stupid ignorance of Asha. Rabindranath has an uncanny ability to capture the human emotions and he presents even the negative traits of human personality in a way, that it appears as a natural part of the person and can never be hated. His characters portray people in their true forms, with both the black and white portions, equally endowed with abilities and shortcomings. This craftsmanship is more than evident in the present novel, where he presents the story without any moral bias, peels off layer after layer of his characters, with the result that a side kick becomes hero, and the vamp becomes the heroine, while the favored Hero Heroine of the first part fall out of grace and are exposed as mere erroneous human beings. The novel is a fanciful study of human mind, which is capable of not only anticipating the future, but is also a zealous pursuer of happiness, without any qualms for right or wrong. However, as usual with the Classics, everything comes to a concluding, socially right end in this novel as well. Another brilliant offering by the talented writer. Though, I would have loved to read the actual words of Tagore, but as I am Bangla illiterate, I am grateful that there are people like Sreejata Guha, who translate the novels, and enable inefficient readers like me to enjoy the sneak peek into Tagore world.